This is what happens when you don’t look closely at what you pick off the shelf. If I had stopped and actually read the label, I probably would’ve left them on the shelf and looked for a “normal” tortilla chip. Because I was looking more at the price, about $1.50 for a 12 oz. bag, than the label, these ended up in my basket to go along with the Corn & Chile Tomato-less Salsa I had picked up on an adjoining shelf. The identity crisis comes from the ingredients. To quote from the bag, “Made with a little Corn, a little Potato & a little Brown Rice. With this combination you wouldn’t expect them to taste like flour or corn tortilla chips. And you’d be right. That doesn’t mean they taste bad. They’re just different in a likable way. While tortilla chips might be the wrong name for them, they sure did go good together with the Corn & Chile salsa. My only complaint is, I prefer a little more salty chip than these. That didn’t stop me from eating them. Trader claims these chips are wheat and gluten free. I don’t know. I don’t have a problem with wheat or gluten, or free for that matter, so I can’t tell you from personal non-reaction experience. He also claims these are “low sodium”. That explains my only complaint with the chip. At a buck-fifty what do you have to lose? You know you’ll eat them. This entry was posted on 09/04/2010 at 08:43 and is filed under Recipes, food, cooking and related items, Trader Joe's. You can follow any responses to this entry through the RSS 2.0 feed. You can leave a response, or trackback from your own site. i hear traders has discontinued tortilla chips with an id crisis. if the sales were down maybe a change of name would help. 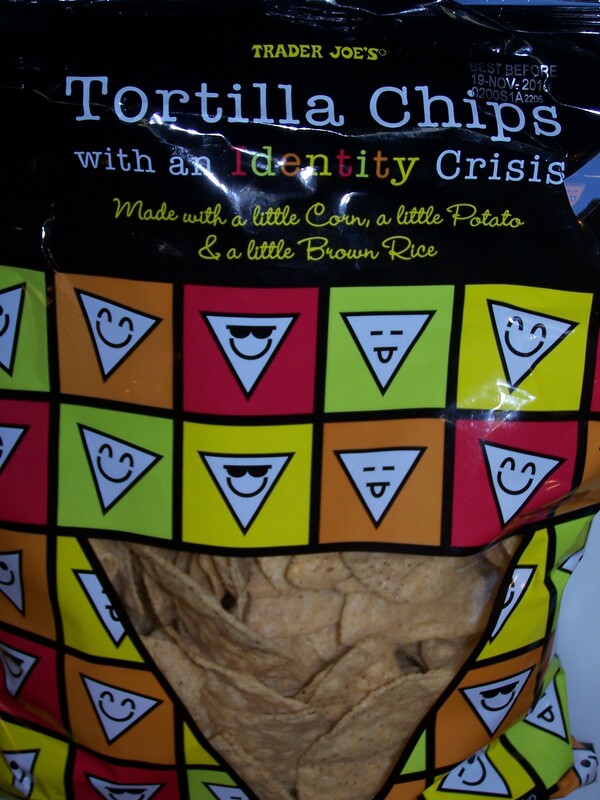 try tortilla chips with id awareness. please keep these on the shelf! !